When you are taking care of a person with Alzheimer’s disease, every day brings new challenges. Just when you think you’ve got the hang of it, the disease progresses, and a new host of issues crop up. New patterns of behavior start to surface. The person becomes less able to perform once-familiar tasks and relies more heavily on you. Here are some tips for coping with some of the most common challenges that people caring for a loved one with Alzheimer’s face. As an Alzheimer’s caregiver, you must identify and correct safety risks around the house. Creating a safe environment for a person with Alzheimer’s disease requires you to look at the home through new eyes. Install locks on outside windows and doors. Remove the locks on bathroom and bedroom doors, to prevent the person from accidentally locking himself in. Use childproof latches on cabinets. Install an automatic shut-off switch on the stove in case your loved one forgets to turn it off after cooking. Keep knives, lighters and matches, and guns secure and out of reach. Remove clutter, including throw rugs and objects that might cause a fall. Install good, bright lighting both inside and outside the home. Label medications and keep them locked up. Plan the bath or shower for the time of day when the person is most calm and agreeable. Be consistent, and develop a routine. Make sure you have everything you need ready and in the bathroom before beginning. Draw the bath ahead of time.Test the water temperature before beginning the bath or shower. Minimize safety risks by using a handheld showerhead, shower bench, grab bars, and nonskid bath mats. Never leave the person alone in the bath or shower.Be gentle, respectful, patient and calm. Tell your loved one exactly what you are going to do, step by step, and allow him or her to do as much as possible. Try a sponge bath. Bathing may not be necessary every day. A sponge bath can be effective between showers or baths. Buy clothing with elastic waists and Velcro enclosures to minimize struggles with buttons and zippers. Have your loved one get dressed at the same time each day. He or she will come to expect it as part of the daily routine. Encourage the person with Alzheimer’s to dress himself/herself to whatever degree possible. Allow extra time so there is no pressure or rush. Mealtimes can be challenging when a person experiences loss in taste, smell or appetite, has problems swallowing or is confused. Choose a quiet, calm, reassuring mealtime atmosphere by limiting noise and other distractions. Be patient, avoid rushing, and be sensitive to confusion and anxiety. Offer foods that have familiar flavors, varied textures, and different colors. Serve small portions or several small meals throughout the day. Choose utensils that promote independence, such as a bowl instead of a plate, or spoons with large or built-up handles. Use straws or cups with lids to make drinking easier. As the disease progresses, be aware of the increased risk of choking due to chewing and swallowing problems. Talk to your doctor about liquid nutritional supplements and other options. At some point, it is no longer safe for a person with Alzheimer’s disease to drive, due to risk of confusion, difficulty with eye/hand coordination and memory loss. Even though the person may be upset by the loss of independence, safety must be the priority. Look for clues that safe driving is no longer possible: getting lost in familiar places, driving too fast or too slow, disregarding traffic signs, or getting angry or confused. Be sensitive to the person’s feelings about losing the ability to drive, but be firm in your request that he or she no longer do so. Ask the doctor to help. The person may view the doctor as an “authority” and be willing to stop driving. The doctor also can contact the Department of Motor Vehicles and request that the person be reevaluated. If necessary, take the car keys. If just having keys is important to the person, substitute a different set of keys. If all else fails, disable the car or move it to a location where the person cannot see it or gain access to it. As the disease progresses, people with Alzheimer’s disease might lose their ability to control their bladder and/or bowels. 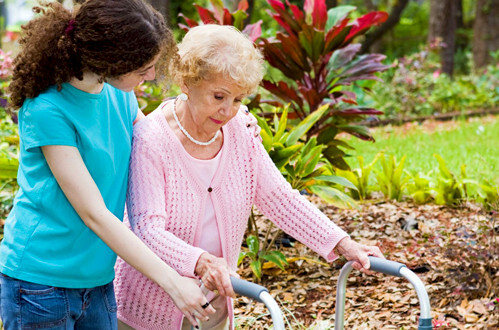 Incontinence can be upsetting to the person and difficult for the caregiver. Establish a routine for taking the person to the bathroom and stick to it as closely as possible. For example, take the person to the bathroom every 3 hours during the day. Don’t wait for the person to ask. To help prevent nighttime accidents, limit fluids in the evening. If you are going to be out with the person, plan ahead. Know where restrooms are located, and have the person wear simple, easy-to-remove clothing. Take an extra set of clothing along in case of an accident. Encourage exercise during the day and try to schedule more physically demanding activities earlier in the day. Set a quiet, peaceful tone in the evening to encourage sleep. Keep the lights dim, eliminate loud noises, or play soothing music if the person seems to enjoy it. Keep bedtime at a similar time each evening and develop a bedtime routine. Restrict caffeine late in the day. Use night lights in the bedroom, hall, and bathroom if the darkness is frightening or disorienting. Avoid arguing with the person about what he or she sees or hears. Try to respond to the feelings he or she is expressing, and provide reassurance and comfort. Try to distract the person to another topic or activity. Sometimes moving to another room or going outside for a walk may help. Turn off the television set when violent or disturbing programs are on. The person may not be able to distinguish television programming from reality. Make sure the person is safe and does not have access to anything he or she could use to harm anyone. Both understanding and being understood may be difficult when trying to communicate with a person who has Alzheimer’s disease. Use a gentle, calm tone of voice. Avoid talking to the person like a baby or talking about the person as if he or she weren’t there. Minimize distractions, to help the person focus on what you are saying. Call the person by name, making sure you have his or her attention before speaking. Allow enough time for a response. Don’t interrupt. If the person is struggling to find a word or communicate a thought, gently try to provide the word he or she is looking for. Sincere Care Services provides in-home and residential Alzheimer’s care, contact us to see how we can help you!